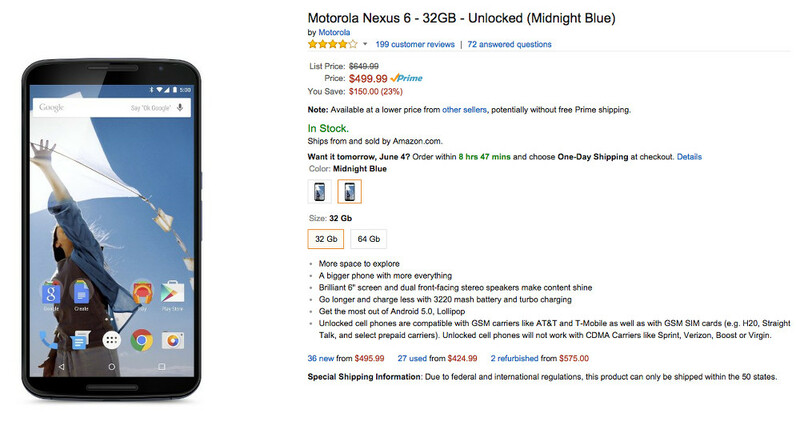 Yesterday, Google surprisingly dropped the price of their flagship Nexus 6 by $150 on the Google Store. We assumed that the deal was a temporary, short-team thing that was exclusive to the Google Store. While the price slashing may be temporary, the deal is not exclusive to Google and has already been matched at other places you should be quite familiar with – Amazon and Best Buy. If buying the Nexus 6 from the Google Store didn’t seem all that appealing or you have Amazon or Best Buy gift cards to blow through, now is your chance. The Nexus 6 can be had for as little as $499 (32GB) at either spot. The 64GB model has also been discounted by $150 as well, dropping it to $549. Free shipping is included at all three places, but Amazon does have Prime shipping for those who are members.